As you can probably imagine, there is a lot of work that goes into a video game. They take years to develop, and that entire time is filled with development decisions and self-evaluation to make sure that all the work being done is actually beneficial to the game itself. Now imagine, after years of dedication to a project, you’ve finally finished it and it’s just as good as you hoped … but nobody knows about it. There’s no word of mouth, there’s no anticipation, and thus, there’s no reason to buy it instead of the AAA game they’ve heard nothing about? It’s impossible to know the quality of something you’ve never played if there isn’t someone in the world talking about it. Ideally, we’d like to avoid scenarios like this one, so we’ve been looking into more avenues of audience development. This will be a process that we need to work on and develop over time, but I think we’ve got a pretty strong foundation of ideas at the moment. The first place we want to go is to IndieDB, a website devoted to indie game development projects, with their goal being, “to connect independent developers of games with players, from the day they start developing their game to the day they release it.” It’s really a great site, full of easy to use functionality for users, both from the gaming sphere and the development sphere. We won’t be updating it as frequently as we update this blog, but whenever we have enough new, meaningful content to share? You can expect a larger update over there! We’re also playing around with the idea of a podcast! None of us have a ton of personal experience in the medium, but I know that everyone involved has podcasts that they know and love. It’ll be a while before we start putting them out. After all, it takes time to figure out what you want your podcast to be! 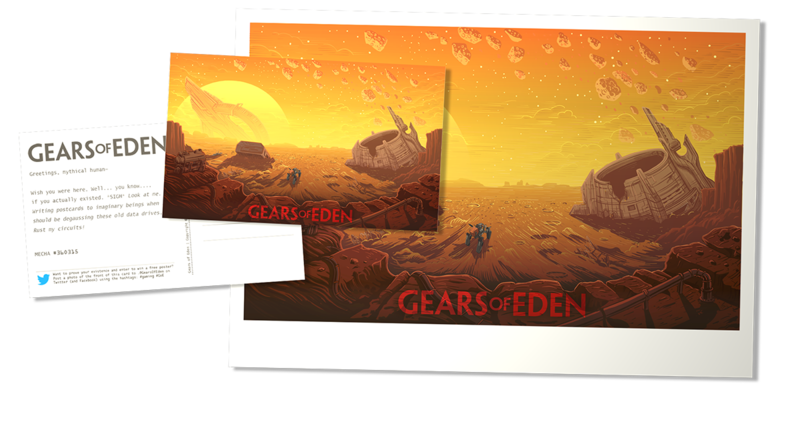 Ideally, we’d want it to be a bit more free form than what you see in these Dev Updates, but without straying so far off from a Gears of Eden related topic that listeners are left scratching their heads, wondering why they’re listening in the first place. Like everything else, it’s a balancing act, but one we feel confident in our ability to pull off. The trickiest idea we’ve had would be to set up a Patreon. Patreon, for those of you who don’t know, is a website designed around allowing users to support creative projects or individuals. While success here would have the obvious benefit of providing us with funding for the game, it would also be a place to showcase behind the scenes developments to users who find themselves fascinated by that and it would also allow us to produce more, regular content to keep the audience at large engaged! Selfishly, I would love to see this work out, since there’s talk of letting me put out monthly Gears of Eden short stories and … well I just love writing. We’re also already getting to work on producing art that would be available through sources like Patreon and our donations page, as seen at the top of this article! Rest assured though, if we do go the route of a Patreon, we’ll make sure of two things. First, before we even start down that path, we’ll make sure that there’s enough content to justify your support, and secondly, we’ll make sure to always be upfront and honest to you about the benefits of your support, both to you and to us. That’s all for this week’s Dev Update though! We’ll be back next week with more news from behind the scenes, and the best way to see those updates (and everything else Gears of Eden) is to follow us on Twitter or Facebook! Thank you so much for all your support throughout this progress, and have a great rest of your week.